Wooden jhoolas have been a part of Indian customs and traditions since the beginning.Even the Gods and Goddesses of Hindu religion are known to be pampered on a wooden jhoola. It is also a part of many festive celebrations like teej. Somehow, the obsession with this magnificent home décor item doesn’t seem to go away. Today, there’s a lot many types of wooden swings available in different shapes, sizes and designs than it was earlier. So, why not make it a remarkable attraction of your home decoration? 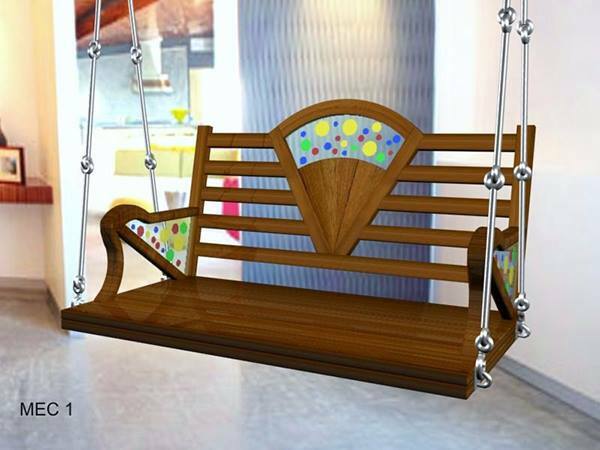 The versatility of these wooden swings makes them fit for home interiors as well as exteriors. Here’s a list of places in and around your house that you can use to suspend the jhoola and create a spectacular attraction. A balcony becomes the perfect junction between your home and the environment around. It gives you an option to remain in comfort while bringing a vista of natural beauty in front of you. Thus, your house’s balcony takes the first spot on the list of perfect places for swing installation. To go ahead with it, take proper measurements of your gallery and choose a wooden swing that matches its size. Make sure you keep the place well-decorated to make it alluring. For people who have a house with a garden, this outdoor place makes a perfect match for installing the swing. What can be better than getting to relax on a swing in the midst of nature? It can be the ultimate relaxation point after a tiring day at work. You can also hang out with family and spend some quality time here. To keep the fascination alive, make sure you clean your garden often and keep all the plants well-pruned. A courtyard is another common area of your house which is generally used by all family members to hang out. For people who have this place in their house, installing a wooden swing there adds a touch of sophistication to the area and the home altogether. You can also use it to host tea parties for your neighbours or invite your friends over for an evening chit-chat and make them sit on and around the swing. While a swing in a living room doesn’t sound much convincing, interior designers have successfully created a stunning allure by installing wooden jhoolas there. So can you! Bring a big wide swing and decorate like a sofa with the right upholstery and cushioning. Suspend it with the back facing a wall of your living room to create a unique and interesting seating area. Yes, you can also create magic for your kids’ room by installing a wooden swing there. Just make sure the size of this jhoola is enough to accommodate your child and give ample space for movement. This way, you can also remain carefree that your child is enjoying in his/her comfortable space. That’s all with the ideas for perfect places to suspend wooden jhoola. Choose your place, decide on the swing design and get going with the installation!